CLICK ON THE LINK OR ANY IMAGE TO ENLARGE THE IMAGE TO FULL SIZE. 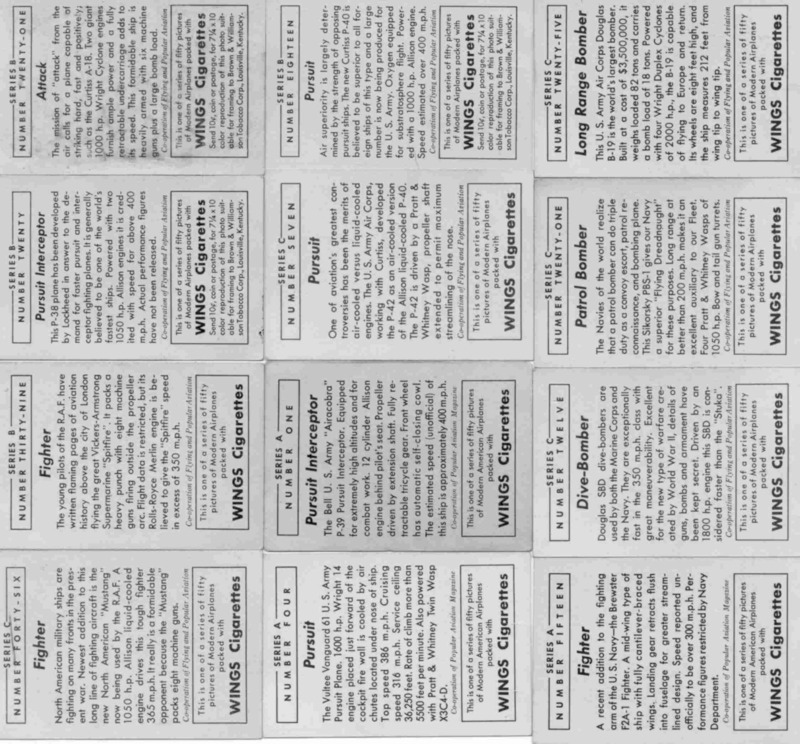 I found a number of airline timetables from 1939 and 1940 and also a couple from the 1950's. Here is an example of one of many timetable covers, the files are so large that the rest are just links and you may view them at your leisure. In the 1930's and '40's there was a brand of cigarette called WINGS. Packaged with each pack was a airplane picture and information card. There were at least three series of fifty cards each. The original series and the A and B series. 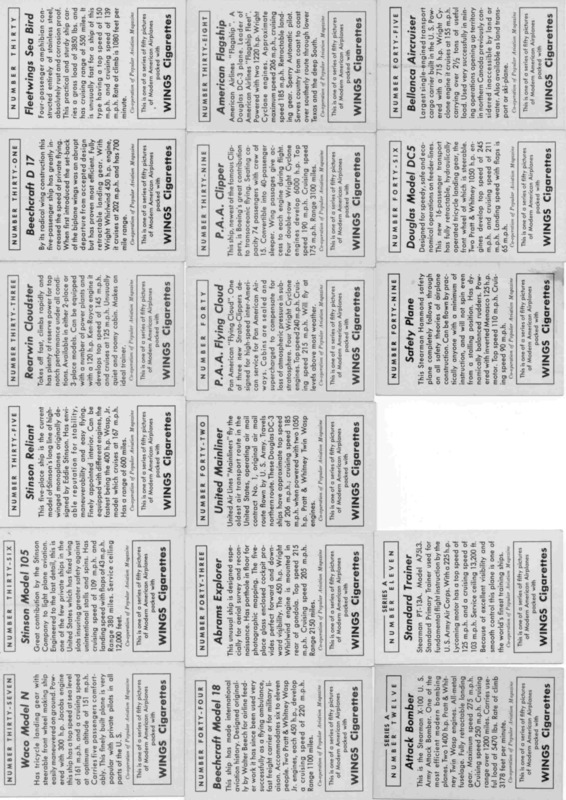 I have scanned all the cards I have and placed them in six JPEG files, three are the front sides and three are the backs. 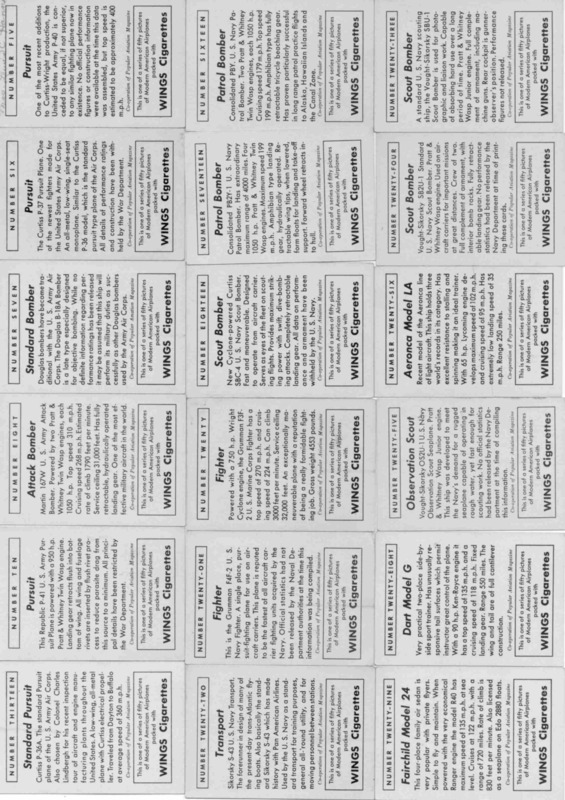 the cards are arrainged in numerical order (with many missing numbers) and the back side layout is exactly like the front so you may see which goes with which. Many of the airplanes are now unheard of models, and possibly never got past the prototype stage. 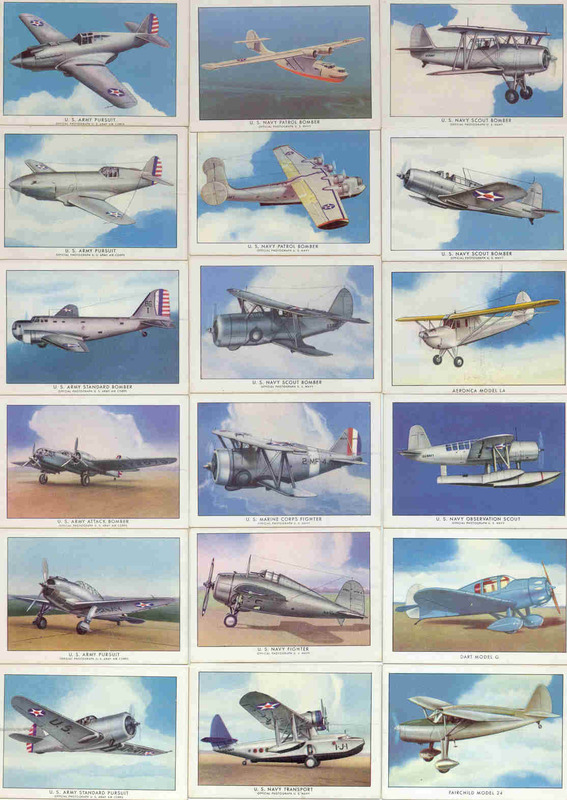 There are civilian and military, US, Candian, and English aircraft shown. These files are so big that I chose to provide you with links rather than show the cards here, the page would take too long to load had I placed the cards on it. Enjoy. If you wish to print these, right click on the image and select 'Save image as...' then save it and use Corel Photo Paint, Adobe Photoshop, or a similar program to print the file you saved. You will have an exactly page sized image by doing this. If you try to print from the browser you will get a huge image that takes up several sheets of paper. First page of Wing Cigarette cards, front side, and the back side. 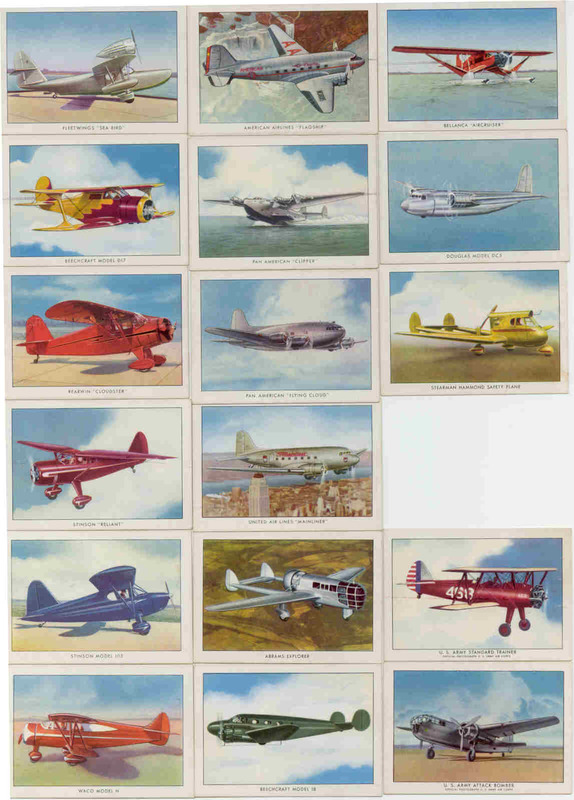 Second page of Wing Cigarette cards, front side, and the back side. 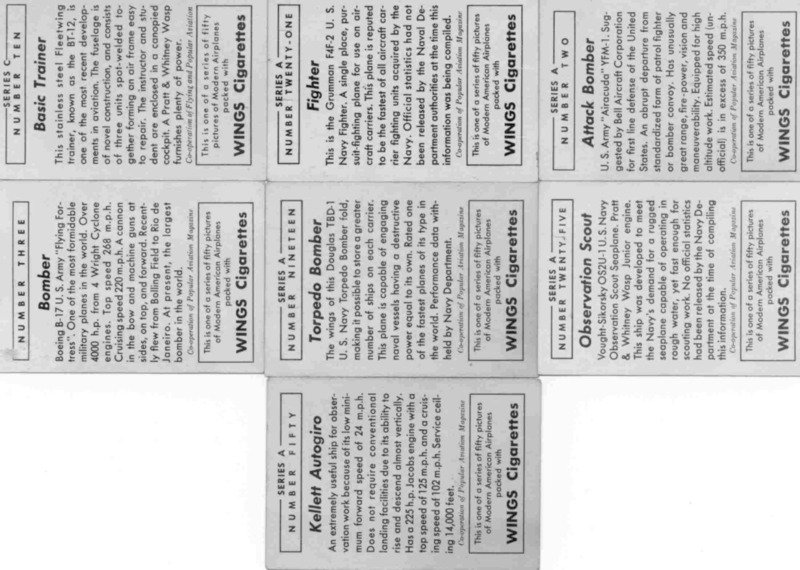 Third page of Wing Cigarette cards, front side, and the back side. 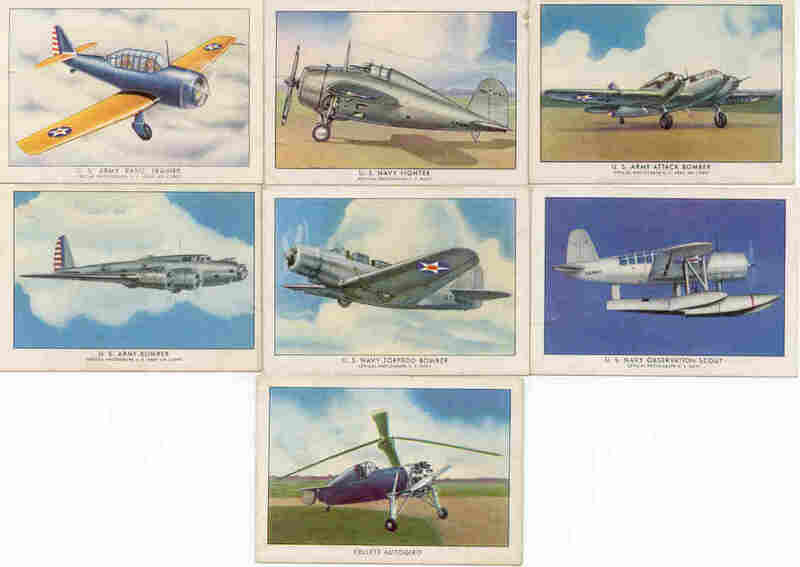 The next two pages of Wing Ciagarette cards are some sent to me by Bob Scott of Los Angeles, California. It seems that Bob's father, like mine, smoked Wing Cigarettes and Bob saved some of the cards. 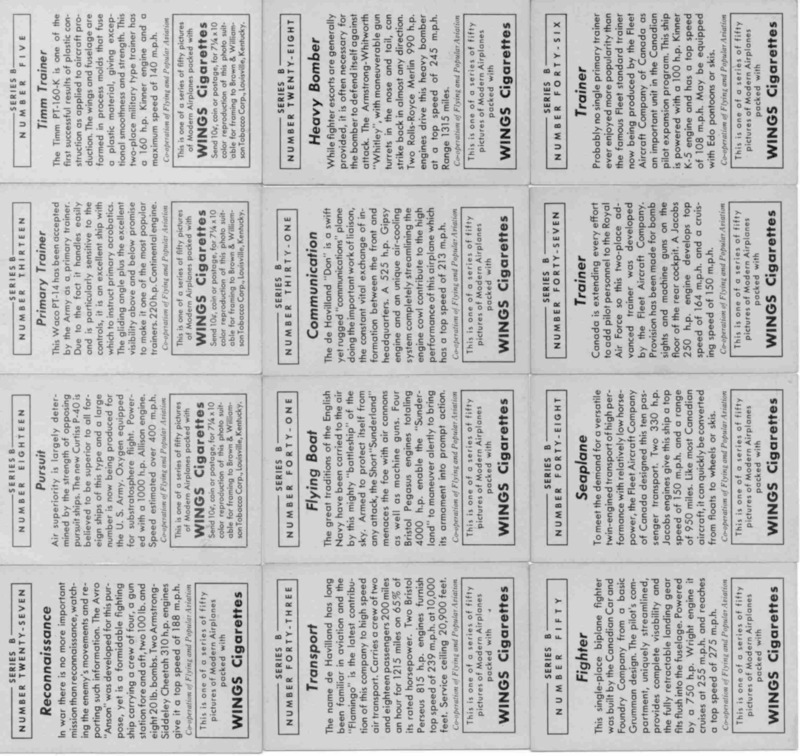 All of these are different from the ones on the first three pages, leading me to wonder how many different cards were actually produced. 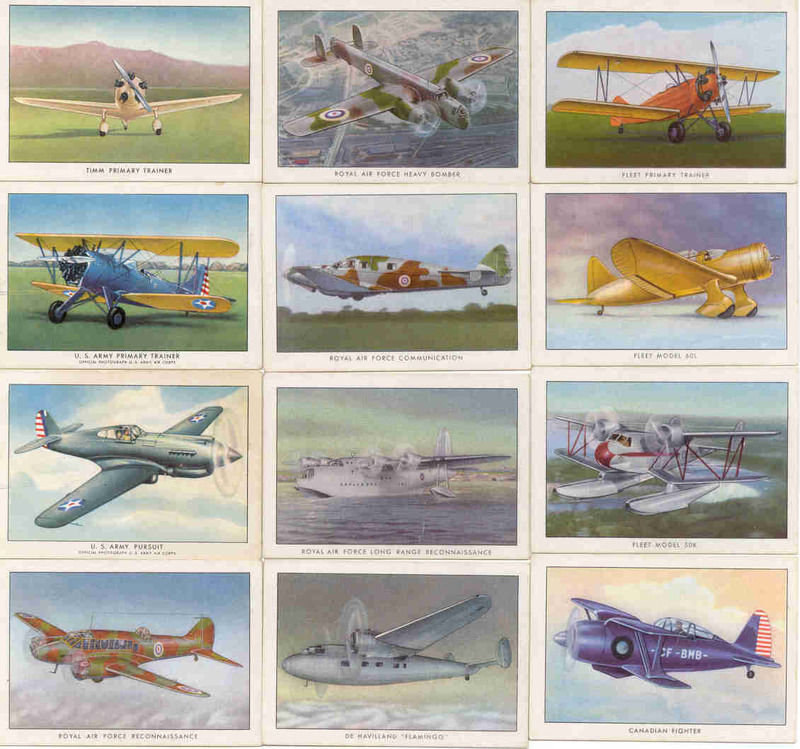 Fourth page of Wing Cigarette cards, front side, and the back side. 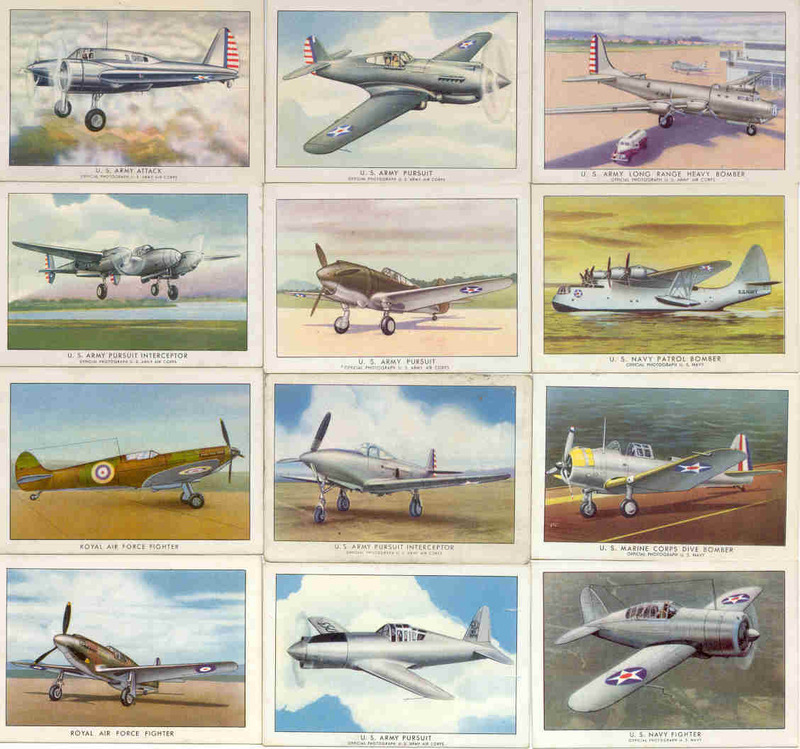 Fifth page of Wing Cigarette cards, front side, and the back side. More old photos from Birmingham, Atlanta, and Fort Worth. 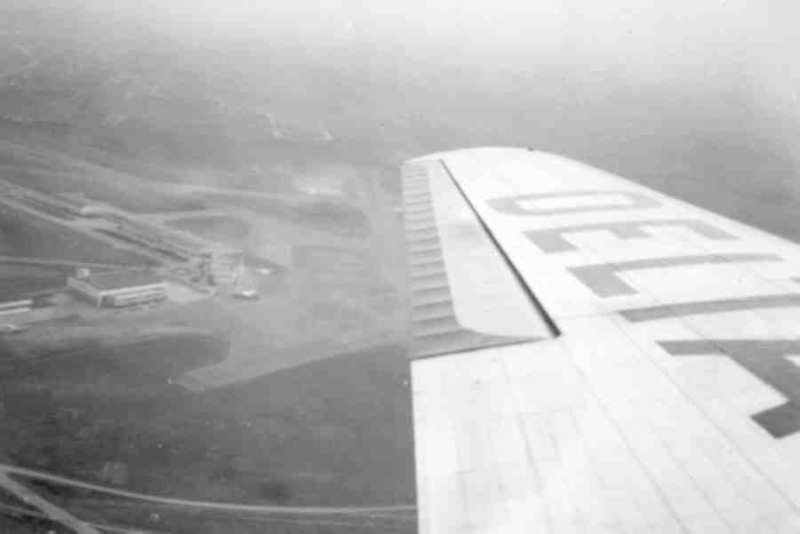 Here is a aerial photo taken from a Delta DC-2 aircraft. This photo was probably made in the spring or summer of 1940 and that is Mecham Field, Fort Worth Texas, under the left wing. Click on the photo or link to enlarge it. Previously, I had identified this as Candler Field, Atlanta, GA, but I recently found a photo scrapbook with this same picture in it and the scrapbook said it was Fort Worth. I had made this scan from a loose copy of the pic that I had and mistakenly made the assumption it was Atlanta. 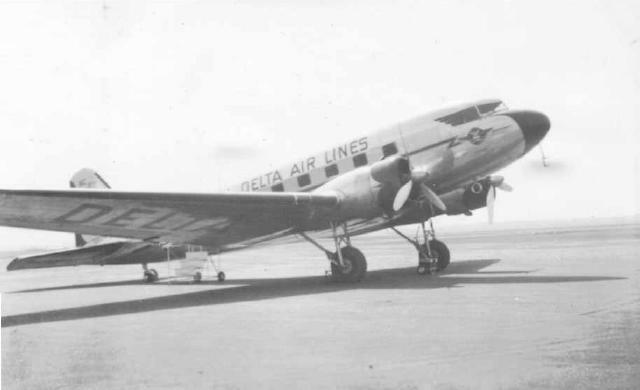 The photo below is of a "new" Delta DC-2. In the spring of 1940, Delta began looking for larger aircraft to supplement the Lockheed 10B's they had been operating. American Airlines, when upgrading to DC-3's Sold Delta five of their DC-2 aircraft. Douglas Aircraft themselves promoted the fact that Delta was operating Douglas aircraft. They ran a full page magazine ad promoting "Now it's luxury aloft over the "Trans-Southern Route" as Delta Air Lines goes Douglas." See the advertisement on my first "hobbies" page. When Delta began operating the DC-2, they decided to take one on a promotional tour. My father was a ground radio operator for Delta in Birmingham at the time and they asked him to accompany the aircraft to Ft. Worth when it was giving promotional rides to city officials and business customers. Dad told me he did not fully understand why they wanted him to accompany the aircraft, but he soon found out it had nothing to do with radios. The hydraulic system on the DC-2 did not have any engine driven pumps, but rather when you wanted to operate the landing gear up or down, you selected the position with a selector lever, and then you operated a hand operated hydraulic pump lever about 75 or a hundred times and the landing gear would go from full up to full down or vice versa. Since the airplane would be hopping rides all day long, the copilot would quickly be worn out cycling the landing gear so many times. This is where Dad, the "radio operator", came into the picture. You can see where this is leading. It became his job to pump the landing gear up and down all day long. One other point of interest. American Airlines, for years, insisted on having the passenger door on the aircraft's right hand side, one of the few airlines to ever do this.. They did this on virtually every propeller driven aircraft they ever had. That is one of the giveaways that this DC-2 was a former American Airlines aircraft. This photograph, along with the one above, were made in Ft. Worth and very probably during the promotional flights. The next two photos were both taken at Mecham Field, Ft. Worth, Texas, according to the markings on the back of the pictures. 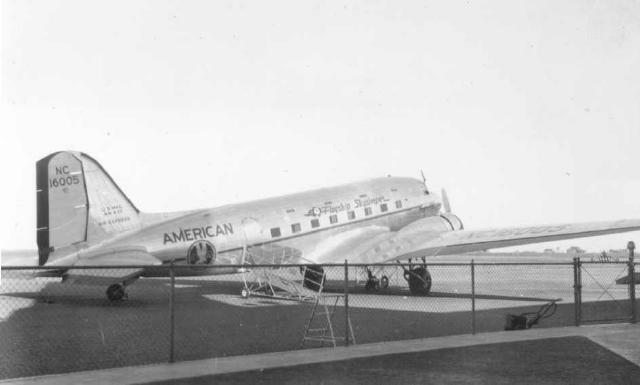 The one below is an American DC-3 with the right hand passenger door, like the DC-2 above. 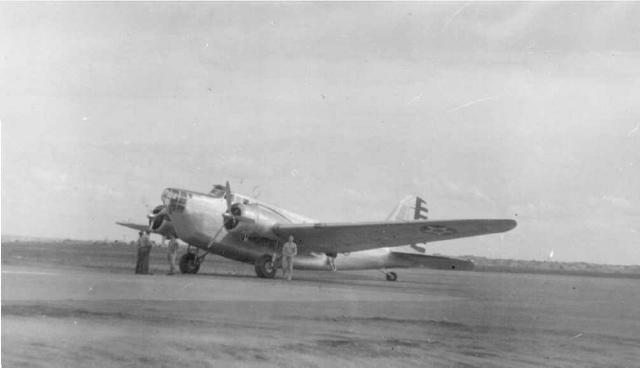 This is a rather unusual aircraft, a Douglas B-18 bomber, operated by the Army Air Corps. It is made using the wings, wing center section, engines, landing gear and tail of a DC-3, with an entirely different, deep belly fuselage. A notably poor performer, it was typical of the Army aircraft of the immediate pre war period, and few were ever built. 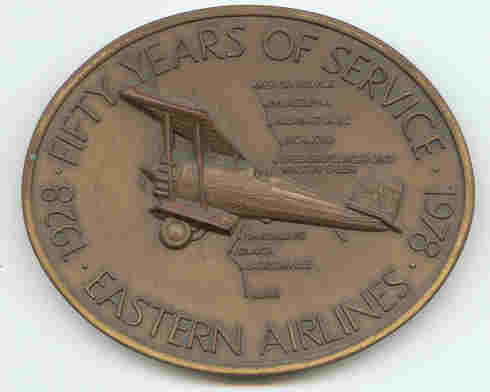 A retired Eastern Airline pilot gave me a medalion which was created for EAL's 50th year. It is about 2.5 inches high, 3 inches across and about a quarter of an inch thick. 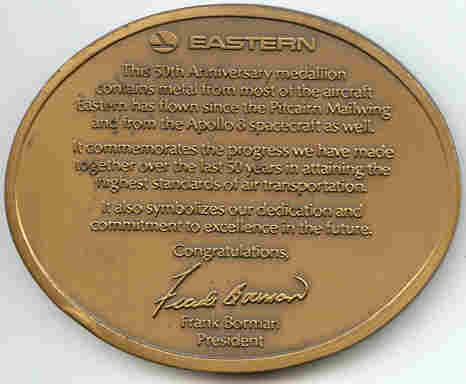 It supposedly is made from the medal of many of Eastern's airplanes (this I personally do not believe). Below is the front and back of the medalion and the front and back of the information leaflet which is packaged with it. 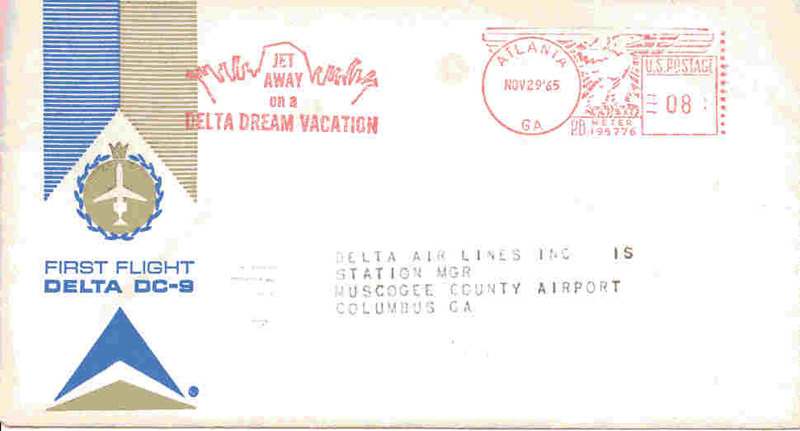 Delta was the first airline to operate DC-9's and this was on the first revenue flight of a DC-9-10, from Atlanta to Kansas City. 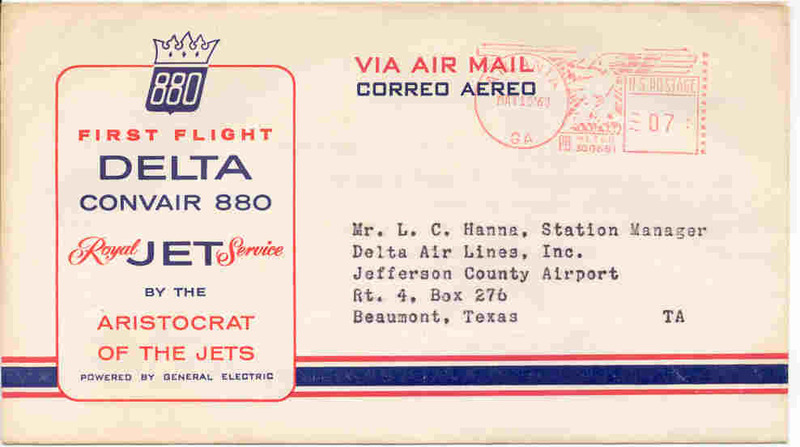 Delta was also the first airline to have operated the Convair 880 four engine jet. This was on the first revenue flight, May 15, 1960. This one you can figure out. 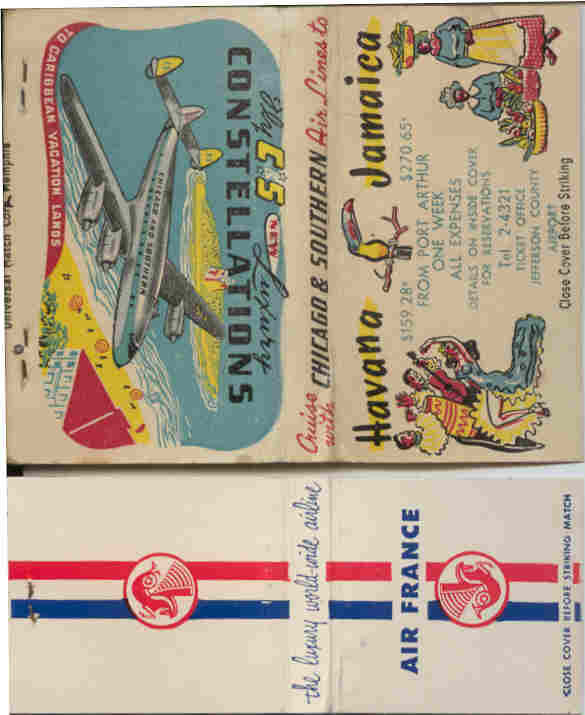 It is interesting how some of the first flight envelopes were nothing more than standard airmail envelopes with the first flight information rubber stamped on them. 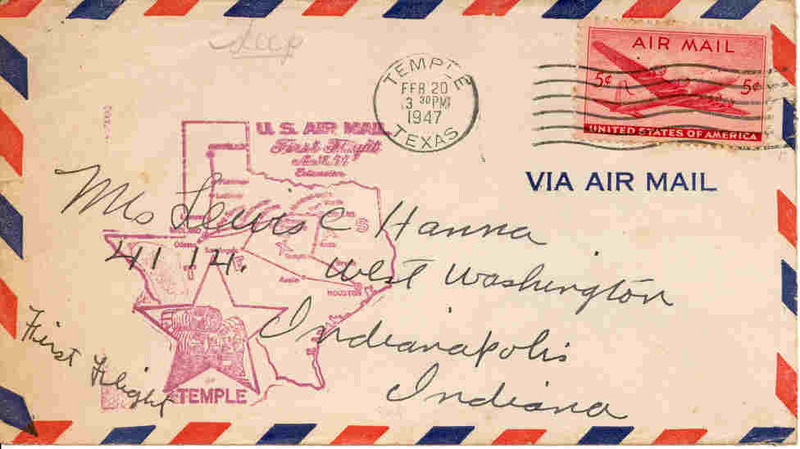 This envelope celebrates the "extension" of Airmail Route 64, passing thru Temple, Texas, where my mother's parents lived. 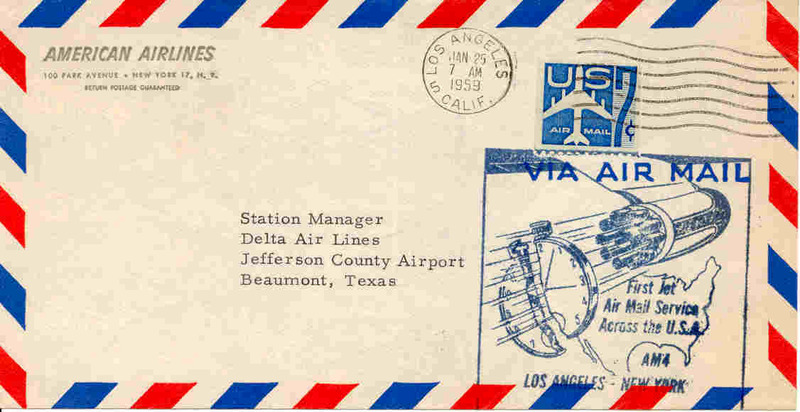 The interesting part of this envelope is that no where on it is any indication of what airline operated AM64. This is a rather unusual first flight envelope, and from the postmark, flew on the Northbound leg of the route. Note that the dates of inaugural service have been changed on the envelope, one of the hazards of preprinting envelopes for events such as this. 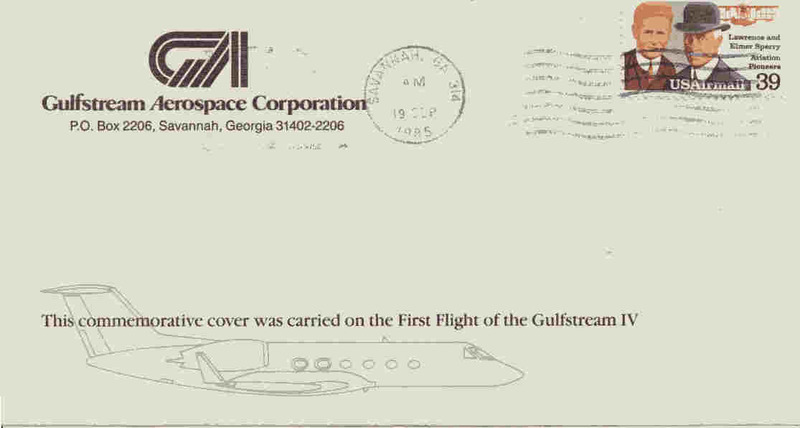 While working for the owner of a Grumman Gulfstream II, we were a regular customer of Gulfstream Aerospace's maintenance facility at Savannah, so they mailed us this inside of another envelope.